This was how we ended our creative writing workshop this week. My creative writing group surprised me with champagne and birthday cake last week. 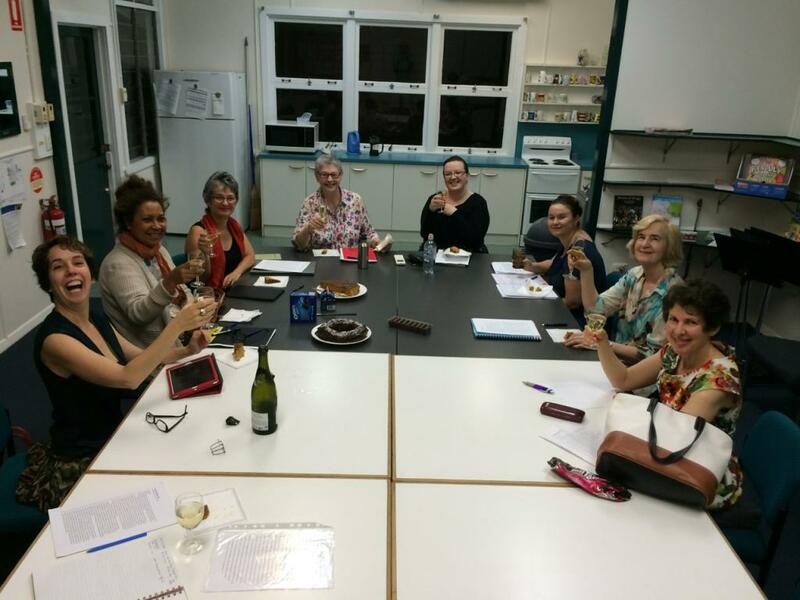 Thank you Judy Ward for baking the delicious coffee-chocolate and Orange cakes and thank you Isabel and fellow writers for the champagne and all the snacks. We also celebrated the end of another great term of work-shopping our stories. The eight-week long workshop ended on Tuesday. Many writers in the group have been attending this workshop at Kenmore, Queensland (Australia) for as long as five years. I have been part of the group for two years. Author Isabel D’Avila Winter is a beautifully crazy and an inspiring teacher. Below was the note I got in email before we had our last workshop. “No reading for next week, because we’ll be too busy eating the leftover TimTams and madly workshopping our work. We’ll also be discussing the upcoming local writing competition, and brainstorming what kind of stories might be suitable to enter,” Isabel D’ Avila Winter. Isabel is seated in front (left). Other participants included writers of memoir, rural romance, fantasy, sci-fi and crime fiction. We are not all females, we do have two male writers. Tom was not well this night and the other male writer, Bill, took this lovely picture. The group members have planned to enter the local writing competition in August. I find that being part of this group was a major contributing factor in my story-telling; both in finding constant inspiration to write and sharing my work for an honest feedback. I also enjoy listening to each writer’s story. Yes, sure am. About to start tutoring creative writing in the Oodgeroo unit for Indigenous students at QUT so preparing for that, and enjoying family and hoping to get out to see friends and beloved nature. Sounds like a cosy and lovely group! poet who writes stories in poetic form ,… well anyway ..
get some kind of indication of the work you have done … especially if it’s something you really like that inspires you … so i almost always make comments for that reason … and of course, i would love to have them myself !… but other than a few cursory words like … interesting or i enjoyed … (and i’ve had few of those) no one has EVER made a serious statement … that has feeling anyway … . i mean, ”wow, that’s great!” would be welcomed. something with SOME indication .,.. in return … to what i have ”given” … since i feel each piece … though written from and for myself … is a gift for others to read. it feels like i’ve kissed or hugged a person and they haven’t shown anything in return .. which is ok … since gifts given are without thought of getting anything in return .. but … i was wondering if you can tell me why it is that i’m ignored? I’ve had one award nomination … and it seems others have them all the time. is it possible that people are intimidated? or … what? maybe it’s hard to comment on what i’ve written. can you enlighten me …. if i”d just receive one really good comment occasionally it’d be great!! i want to know ‘who i am to other writers.’ i guess this is one of the reasons why i shy away from writers workshops or classes .. so … if and when you have the time … ?? thanks … this is helpful .. i’ll let you know about Broadchurch … it’s a series about a boy who was murdered in a small town … i thought it took place in Papua. i’ll let you know. i started getting more ‘likes’ recently. it still seems a mystery to me that, despite the fact that i know some of my posts are really pretty good (of course, what writer doesn’t feel that way about their writing) and despite the fact that i have almost 300 followers … which by some standards is not that many but …i’m pleased with it, i get few comments! wish i did. but maybe this is typical for most bloggers unless the are wildly successful with lots of followers …. You all look like you got on well together.